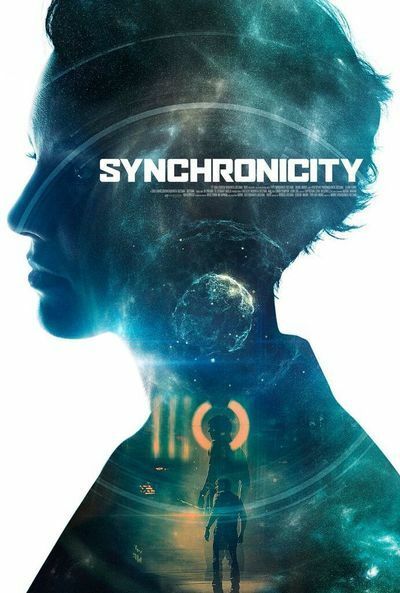 “Synchronicity” is a sci-fi noir that attempts to do on a very low budget what its most obvious progenitor, Ridley Scott’s “Blade Runner,” did on a much bigger one: dramatize various cosmological imponderables with a sense of doomy wonder and dystopian stylishness. As this film’s means are too minimal to accommodate stars or gee-whiz special effects, its appeal will likely be limited to avid devotees of its sub-genre. If one did not know that independent writer-director Jacob Gentry had made previous features, “Synchronicity” might be taken as a movie made as a film-school MFA thesis. Though its commercial prospects are obviously extremely limited—to the point that it might’ve made more sense as a straight-to-VOD release—it illustrates Gentry’s skills in all relevant filmmaking departments to fine effect. From the film’s opening scenes, it’s clear the viewer is in low-budget-feature world. The setting is a lab—we never know the place or year—where an ambitious scientific experiment is underway. After days of hard work, the three scientists involved are all frayed nerves and caffeinated perseverance. But the stakes are huge: project mastermind Jim (Chad McKnight) and associates Matty (Scott Poythress) and Chuck (A.J. Bowen) are attempting to tear a wormhole in the space-time continuum and send something through it, proving the viability of time travel. The lab here looks like it might’ve cost a few thousand dollars to assemble, with much use of transparent plastic sheeting and whirring machines with knobs and dials that seem like they could date from the 1980s. But Gentry is smart enough not to disguise or apologize for his Ed Wood-level technical means. With admirable conviction, he concentrates on telling the story, showing Jim’s experiment quickly producing results: a pristine dahlia (more a noir reference than a sci-fi one, of course) comes through that wormhole, ushering humanity to a new scientific frontier. Complications arise at once, naturally. Jim’s efforts are being bankrolled by Klaus (a strong turn by Michael Ironside), a domineering, super-rich businessman whose motives are not at all altruistic, to say the least. But a perplexity that seems oddly to arise directly from the experiment itself takes the comely form of Abby (Brianne Davis), who appears just after Jim emerges from the lab and seem to know him already. It gives nothing important away to note that the film’s shift from acts one to two involves Jim’s going through the wormhole, with the result that there are soon two Jims—one from a week before and the current one. Thus what’s set up as a time travel story is less that—we never visit the distant past or future – than it is a doppelgänger tale, though the gist here is speculative-scientific rather than psychological-symbolic. Apart from a couple of very minor roles, the five characters named above comprise the film’s dramatis personae, so the story focuses entirely on their interactions, with the two lab associates of course being less important than the mysteriously motivated Abby and her torrid affair with Jim, and her and both Jims’ relationships with the menacing, manipulative Klaus. Having such a small number of characters, like the limitations caused by budgetary constraints, might sound like a recipe for creative claustrophobia, but Gentry turns these givens to his advantage, almost as if using “Synchronicity” to articulate a less-is-more filmmaking philosophy. The movie’s 100 minutes remain consistently engaging not only because its narrative twists are mostly smart or intriguing (even for those who can’t keep a firm grasp of the scientific ideas being bandied) but also because cinematographer Eric Maddison creates an eye-catching visual palette full of noirish shadows and silvery light while Genty composes every frame with understated fluency and expressiveness. Gentry has spoken of the film as having a style that’s “analog.” While that touches on the subliminal appeal of avoiding heavy-handed digital effects, with which too many of our sci-fi/fantasy films are now entirely overloaded, it also suggests to possibility of the viewer contributing imaginatively to the film’s feel and meaning—and that indeed may be the greatest luxury currently afforded by low-budget filmmaking.